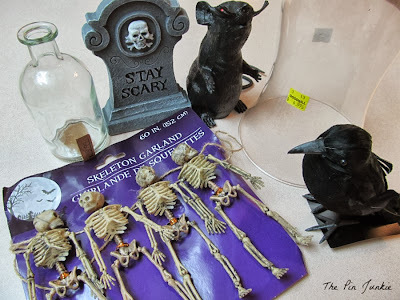 I don't usually decorate for Halloween because I don't like cheap plastic decorations and I don't like blood, guts, and gore, but on a recent day out doing errands, I found some items that I thought would make a good Halloween vignette. 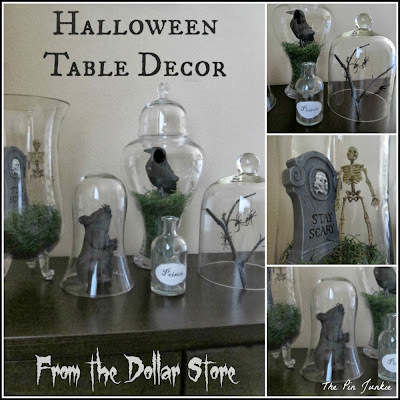 Several pins on Pinterest inspired this idea to decorate for Halloween with a spooky tablescape of creepy crawlies, spiders, skeletons and other eerie items using glass containers. I decided to fill glass containers, vases and bell jars with macabre objects to display. This tablescape reminds me of a sorcerer's workshop full of odd and mysterious items and shelves full of strangely shaped bottles and containers. On one of my errands, I made a trip to Goodwill to donate some items. I can never seem to donate to Goodwill without going in for a peek and coming out with something new. This time I found a bell jar for five dollars. 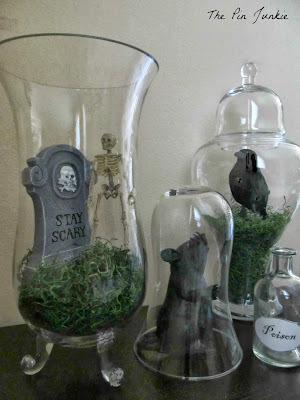 I love bell jars and the price was right so I snatched it up right away. Seeing that bell jar reminded me of something I'd seen on Pinterest which used jars for a Halloween tablescape. My imagination was fired up, so my next stop was the dollar store. Yes, I know I just said that I didn't like cheap plastic decorations, but I had a plan and I thought I could make those cheap plastic decorations look good. from Goodwill and the dollar store. I also used a twig from the back yard and painted it black. I was able to use some things I already had. The bell jar with the spiders I borrowed from this project. I made a quick label for the small jar and labeled it "poison" just to make it extra spooky. so the items had something to rest on. and they're decorations I can live with! Inspired by multiples pins here, here, and here. Fabulous! I don't get to the dollar store very often, but I see I need to make a visit sometime soon. I love what you've created. Love how the bell jar turned out! Creepy but cute and you did not break the bank decorating. I make myself avoid the dollar store - too much temptation! I know what you mean. It's so easy to come home with bags of stuff you don't really need. Those low prices really encourage a impulse shopping! I like what you did and I'm Pinning it. Thanks! I love your jars! 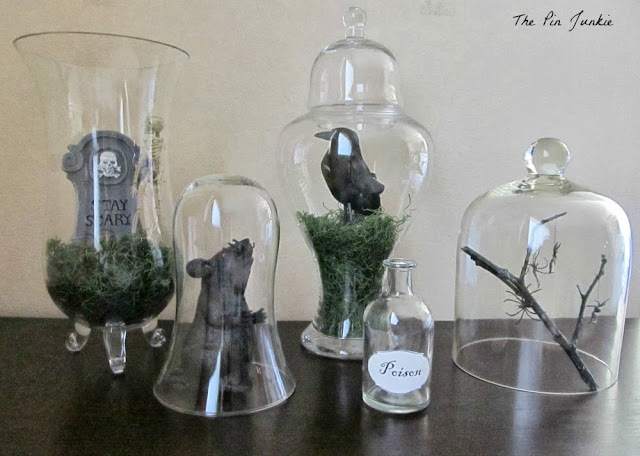 I too have fallen in love with bell jars. I made one for Halloween from a Wal-Mart vase, but yours is a real bell jar. Dollar Tree has the most awesome Halloween decorations - I have to admit that I'm a DT Addict! Cheap yet classy. This is a win. Such a great idea for regular vases! Looks great and would be fabulous and festive touch to my mantle. 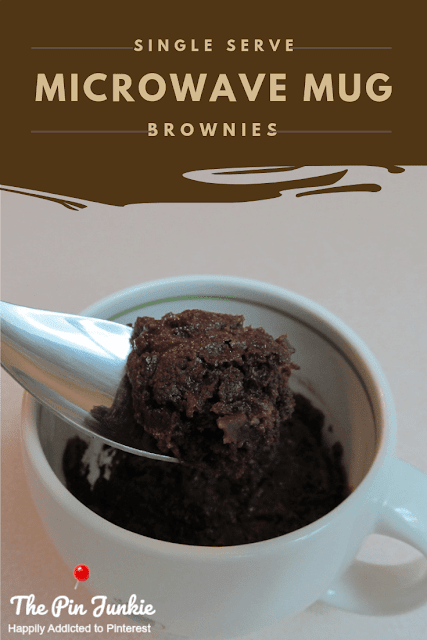 Stopping by from the All Things Pretty link-up :) Have a great rest of your week! Great ideas! 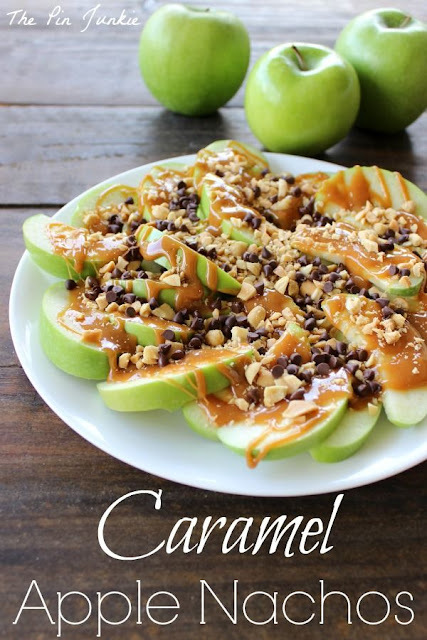 I really love these and unlike most crafty things, this is something I can do! Thank you! Great idea and something I can actually do! Thank you! Oh for crying out loud, your Halloween stuff is so darned cute, awesome and with so little. 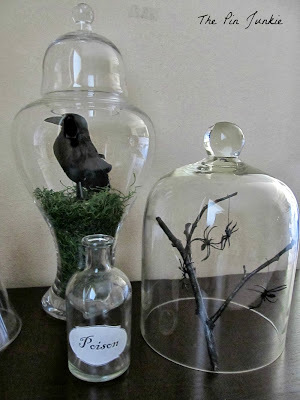 Aren't the bell jars and cloches versatile? I got 2 of the small glass covers last week at our local thrift store for $1 each since they didn't have little cheese plate with them, didn't want them anyway. Those things are really heavy. Well shucks, our $ tree was quite out of most of any good Halloween stuff to make things. What little they had was up front and quite scant. Ah well. I was hoping to find some little pumpkins to paint and glitter but no such luck. Like I really need more Fall around this joint. We have 2 $trees in Grand Junction but when I asked to go to one I prefer I got grumbles so took what I could get, some people have no sense of cooperation, lol I'll have to forgive him as he was getting hungry. I love how people can find such great stuff at Goodwill. I really need to get myself over there now that I'm more in a crafty state of mind. This turned out so cute. 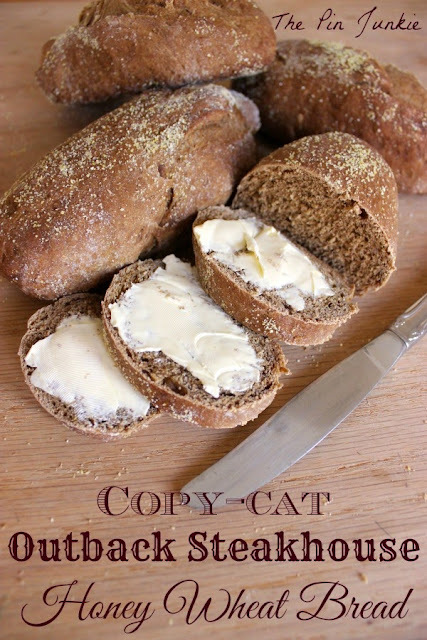 Thanks for linking up to Weekend re-Treat Link Party. VIsiting from #LOBS and have to say that these are just awesome. So going to try scouring our local thrift and dollar stores for some amazing crafty deals (though they're pound shops this side of the pond). Thanks for sharing! You DID create a wonderful Halloween vignette that looks super "classy" and not like "cheap plastic stuff"! 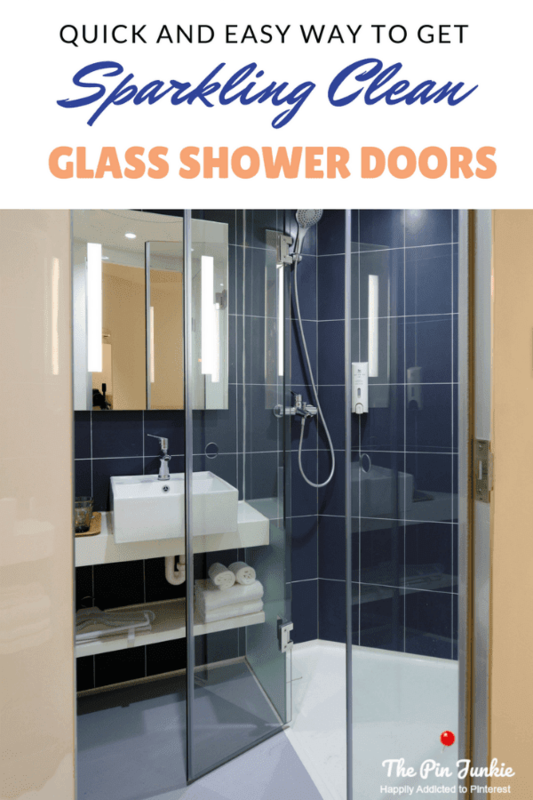 Its amazing how just putting things under glass elevates them to a whole new level! I like how you added the green filler and the Poison label on the bottle is perfect! Visiting from Common Ground. This is great and I love that it's totally cost conscious. 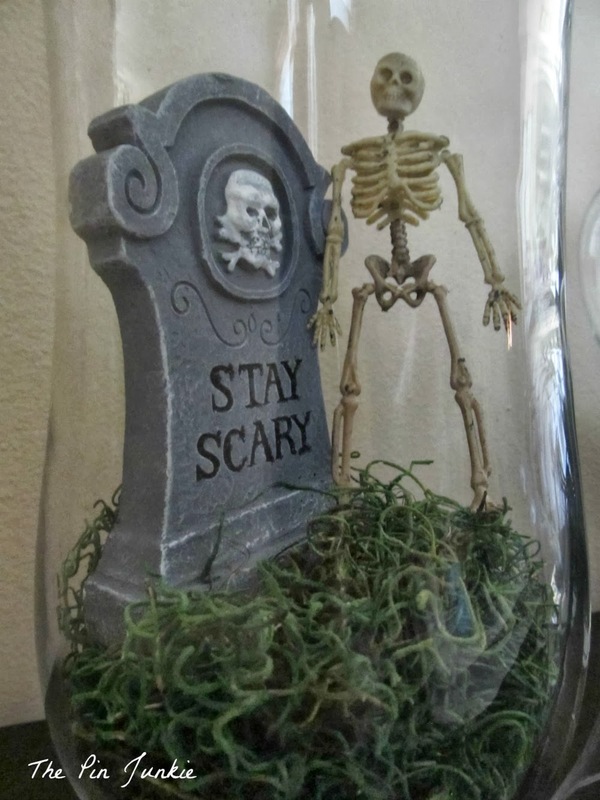 A must for seasonal decor in my opinion! 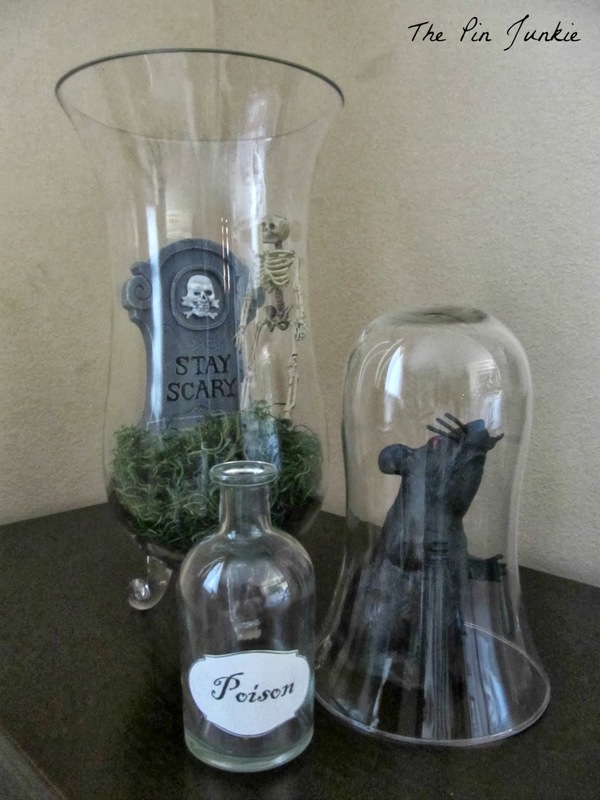 You created some fun displays of Halloween under glass. My cloches are my favorite decorating accessories! I especially love the little branch and spiders. EEK! Thanks for sharing it with SYC. 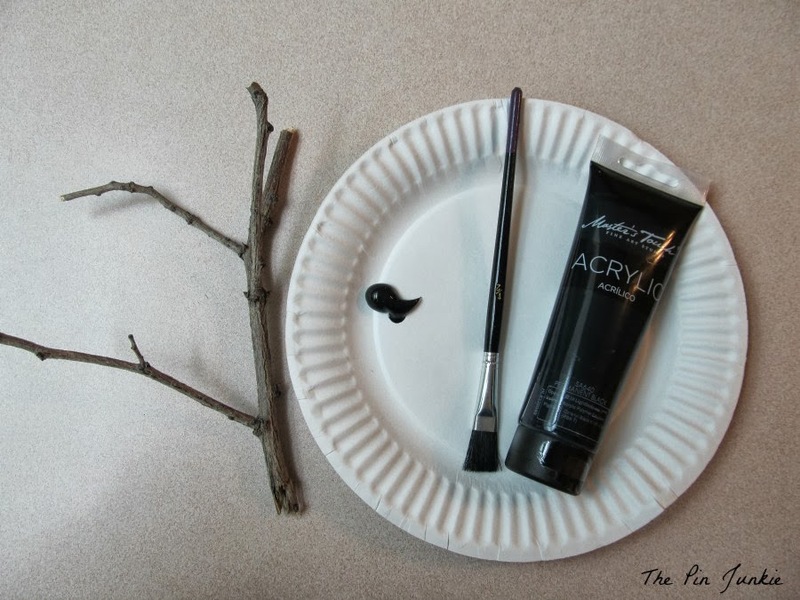 Glad you shared this great and thrifty plan for Halloween! This one I will place in my list of great designs for I must find those cute critters at Dollar Tree. The bell jar price was fabulous better go thrifting and look for one. Have a great week! Just love the display! All for so inexpensive! I love your decorations! What great finds! This is awesome! I especially love the twig with the spiders. I used dollar store things to decorate for Christmas last year, and now I know I can do it for other holidays, too! Congrats! You were one of the most visited links at SYC last week. Thanks for the feature Jan! I appreciate it! This is great...Love the Dollar Store! 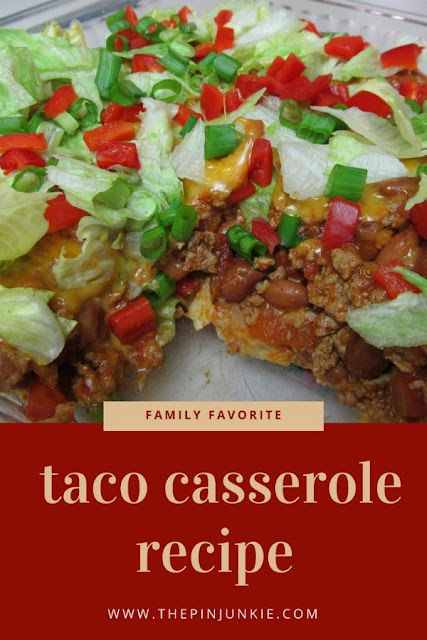 Thanks for sharing at the Krafty Inspiration Thursday Link Party, you have been chosen as one of the top 5 featured posts at tomorrow’s party. Great idea! I really like the blackbird. I think I will try that next year!